Do you know you can connect to a source of infinite energy? Most people don’t realize that there are 2 free energy sources available every day that you can plug into. They are so obvious that we overlook them. The two energy sources I am talking about are Earth and Sky. If you know how, you can connect with the Earth and gain tremendous grounding and presence. Likewise, you can tap into the energy of the Sky (star energy, energy of Spirit – however you imagine it) and receive spiritual sustenance. When you don’t consciously tap into these free sources of energy, you may find yourself stressed, anxious and scattered. When you do consciously connect with earth and sky, you feel grounded, present, nourished and connected to SOURCE. So how do you access this source of infinite light, love and energy? The figure above is an image of Gaia, Mother Earth and is your guide to connect with SOURCE. She is the main figure on Megan’s first Sacred Robe. 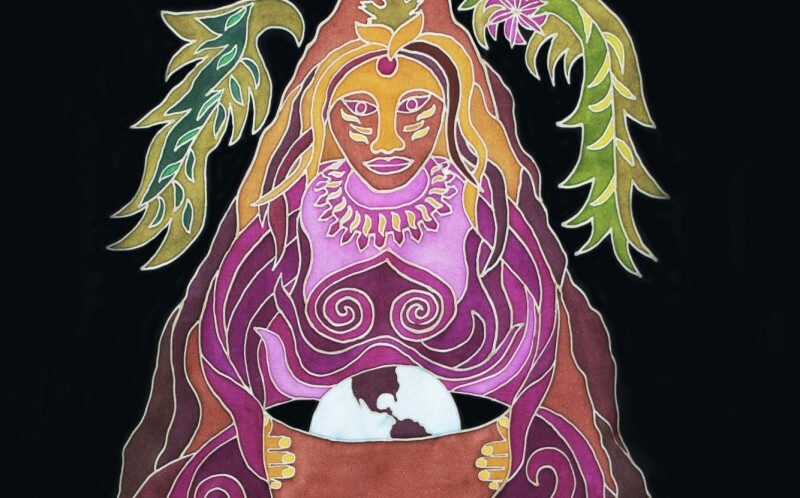 She is a depiction of sacred mother earth and she will help you connect with earth and sky so you can tap into your infinite energy sources on a daily basis.